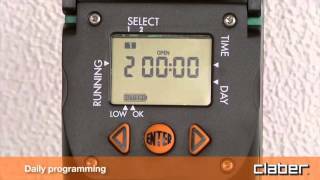 Manage up to 2 irrigations a day with precision and flexibility, programming times and frequencies with only three keys and displaying all the functions on a large liquid crystal display. The programming procedure is summarised on the back of the protective cover. There is the option of selecting an irrigation time from one minute to 23 hours and 59 minutes and of excluding days of the week, if necessary. Battery-operated, therefore, no electrical connections required: simply screw it onto the tap. Its compact design allows it to be easily installed even in confined spaces. Using this automatic one-line water timer you can set 2 watering cycles a day. Featuring just three buttons for easy programming, the large display clearly communicates to the user all the information required by means of easy-to-understand symbols and numbers. 2 Water cycle times vary from 1 min to 23 hours and 59 min. Weekly watering cycles may also be programmed with the exception of the days you wish to omit. It is also possible to display the cycles programmed and delete those cycles no longer required. The unit is fitted with a washable stainless steel filter. One 9 V alkaline battery can power the unit for an entire season (complete with digital battery status indicator). The electronic components are perfectly sealed. With an operating pressure range of 0,1 to 12 bar, “Aquauno Video-2” is 100% quality controlled and tested.